In Bruce Owen’s article in the Winnipeg Free Press “Chiefs agree to work on revenue sharing” dated Aug. 23, 2013, Manitoba’s Energy and Mines Minister Dave Chomiak announced that seven First Nation Chiefs had agreed to work with the province and mining companies on revenue sharing in the form of jobs and economic opportunities related to mining. Chomiak was also quoted as saying that the mining companies are onside with sharing revenue from mines with First Nations. However, in dismissing Red Sucker Lake First Nation’s actions to evict Mega Precious Metals from their territories, he failed to present the whole picture to Manitobans. Manitoba is one of the only provinces that does not have a First Nation consultation policy, despite the Supreme Court of Canada saying since the 1990’s that the provinces have a legal duty to consult, accommodate and obtain the consent of First Nations for activities on their reserve, treaty and traditional lands. Despite their reference to a “draft” policy, First Nations have been left out of decisions in relation to natural resources on their lands. This has been a long-standing grievance with First Nations whose inherent, Aboriginal and treaty rights are constitutionally-protected. The United Nations Declaration on the Rights of Indigenous Peoples which Canada supported, also guarantees protections for First Nations lands and resources and reaffirms that states require First Nation consent. While Chomiak’s quotes make it seem like Red Sucker Lake is the only First Nation opposed to illegal mining in their territory; that could not be further from the truth. 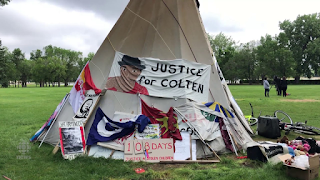 Mathias Colomb Cree Nation has also taken steps to protect their traditional, treaty and reserve lands from Hudbay Minerals - a Canadian mining giant currently in court for alleged abuses of Indigenous peoples against mining in Guatemala. Hudbay was issued Stop Work Orders and eviction notices after failing to talk to Mathias Colomb Cree Nation. These two communities are not alone in their efforts. On April 26, 2013, a protest was held outside of the Mines Branch in Winnipeg where approximately fifteen to twenty Chiefs, supported by Idle No More and other grassroots community members, were in attendance. Nine Chiefs, including Assembly of Manitoba Chiefs Grand Chief Derek Nepinak, Manitoba Keewatinowi Okimakanak Grand Chief David Harper and Southern Chiefs Organization Grand Chief Murray Clearsky, as well as Chiefs from Manto Sipi, Red Sucker Lake, Mathias Colomb Cree Nation, Wasagamack, Buffalo Point, and Garden Hill First Nations, issued a press release expressing very specific concerns against Manitoba’s illegal licenses and permits. The Minister also failed to share that the mining companies are not onside with sharing the wealth from First Nations lands and resources. Hudbay Minerals has never provided any of the wealth to Mathias Colomb Cree Nation and its mining operations have negatively impacted the health of the plants, animals and waters in their territory. Similarly, Mega Precious Metals has not indicated a willingness to share the wealth from its mine on Red Sucker Lake territory. It is due to this consistent refusal by the province of Manitoba to comply with constitutionally-imposed legal obligations to First Nations, and the mining companies reliance on illegal licenses and permits, that First Nations in Manitoba are rising up to defend their rights. Even the United Nations report on mining on Indigenous lands deems licenses issued this way as “tainted” and not legal. For Minister Chomiak to say that the mining companies are onside is perhaps the most outrageous claim in the article. In actual fact, both Hudbay and Mega Precious instituted heavy-handed measures against Mathias Colomb Cree Nation and Red Sucker Lake First Nations when they went out on their traditional lands and engaged in their peaceful traditional activities. 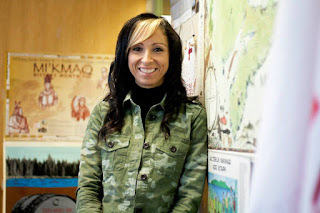 The RCMP were called in, litigation was filed against the Chiefs and community members and injunctions were obtained to keep these First Nations off their own lands (and in the case of MCCN, an injunction was also obtained against Pam Palmater, an activist with Idle No More). 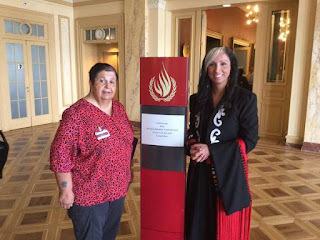 The Assembly of Manitoba Chiefs and other First Nation organizations have passed similar resolutions supporting First Nations in their efforts to protect their sovereignty, land and resources. But this issue just isn’t about First Nations - First Nations are trying to protect all Manitobans from the province’s illegal activities, like allowing Hudbay to develop a mine in a provincial park. It’s time Manitoba recognized the sovereignty and ownership of First Nations over their own lands and resources and started finding ways to work together to share the wealth and protect the lands as envisioned by the treaties.